Check out the screenshot below; I mentioned previously that perhaps you wanted to know how many 9th graders took a state assessment. Notice, my total is 3 because I have only 3 9th graders in my column D1:D11 (that means cells 1 through 11 in row D). 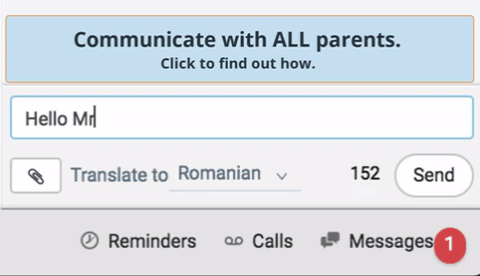 Obviously in this example it isn’t that helpful because I have very few kids, but what if I had 10,000 kids at my district? That would be difficult to count by hand! A better way to design the formula would be to reference another cell that you can then change instead of explicitly referencing ‘9’ as the grade level you’re interested in. That way you can change the grade without needing to alter the function. In this case, G3 is where I’m changing the grade. That’s pretty much it; super simple and super helpful. 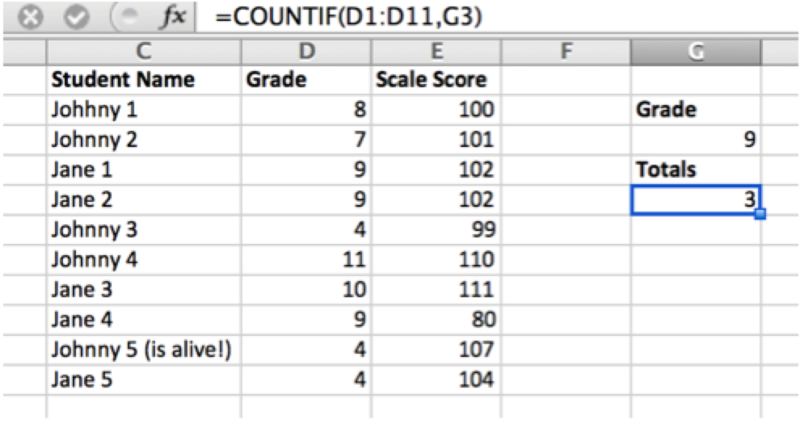 C: The row I want to add together (example in our case, the scale score to add if the student is in 9th grade). Checking out our same excel file from last time, let’s look at the picture now. 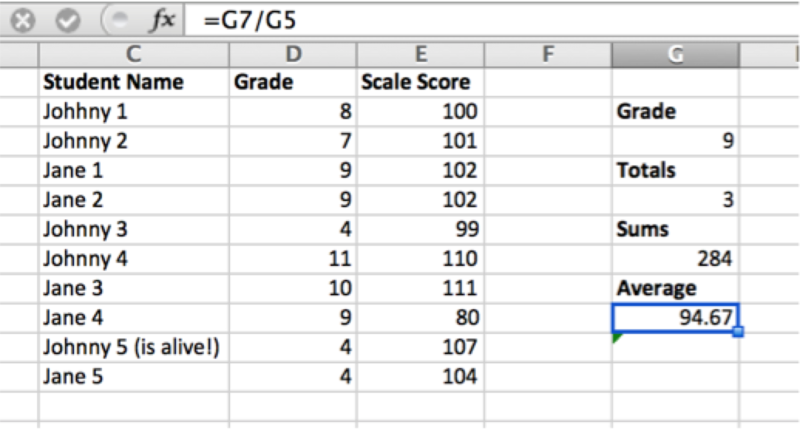 In the example above, I’m looking at Column range D1 through D11, then (because I’m excel savvy) I’m looking at my grade in the G3 cell just like we did in the example above, and finally I’m telling excel to add the values together in the Scale Score column. Why would I do this for scale score? Well, look what we have: We have the total number of 9th graders, we have their summed Scale scores, all we have to do is divide one from the other and voila!! We get our average scale score! P.S. : You can do the same thing in one step with AVERAGEIF. D: For our purposes, you want to always choose 0 (which is FALSE, which means that you want to match exactly. If you put a 1 or TRUE, you will look for approximate matches, which is more explanation than this blog can handle). This is the “other” sheet that has the different data pieces on it. Notice that it is sorted by Percentile and so the names aren’t in order, oh no! Not to worry, all my vlookup is saying is “lets look at this sheet”. That wasn’t too bad, right? The next argument in the function is just the number 3. Remember in this case that means we are saying “On my primary sheet, I want to match the data from my ‘other’ sheet and then display what’s on the 3rd column”. I’ve helpfully labeled it Percentile as well to avoid confusion. Lastly, I put a 0 because I only want to display data on my primary sheet if I have an exact match. 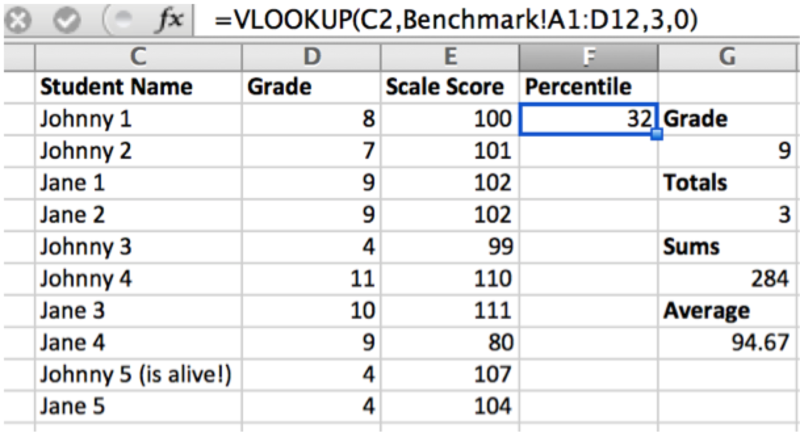 NOTE: With vlookup, what you’re matching has to be in the first column of your selected table. 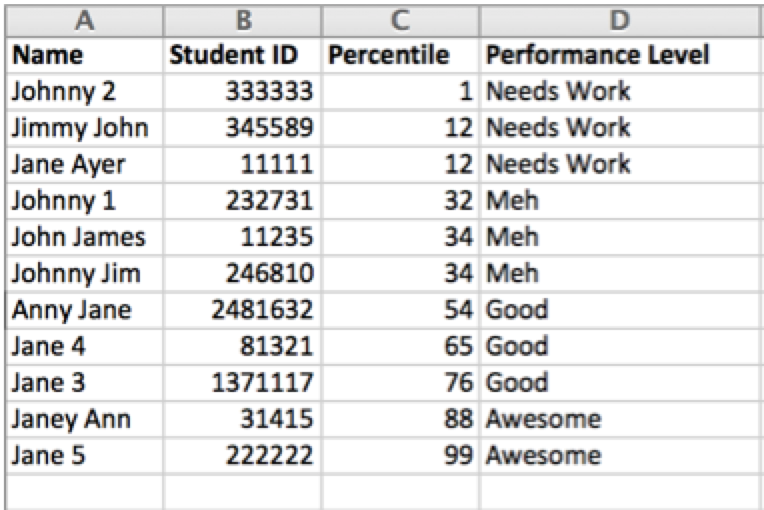 In our example, I’m looking up the student name from my primary sheet, so the first column of my “other” sheet where I’m looking up the percentile has to be a list of student names. The last step is to copy that formula down into the remainder of my rows on my primary sheet and we are done!! P.S. : You can do the same thing with rows by using HLOOKUP. There! Now all of my #N/A errors are displaying the words “No Test.” I simply used some text if something was an error, but you can also use another function, even another vlookup function that references a different sheet! 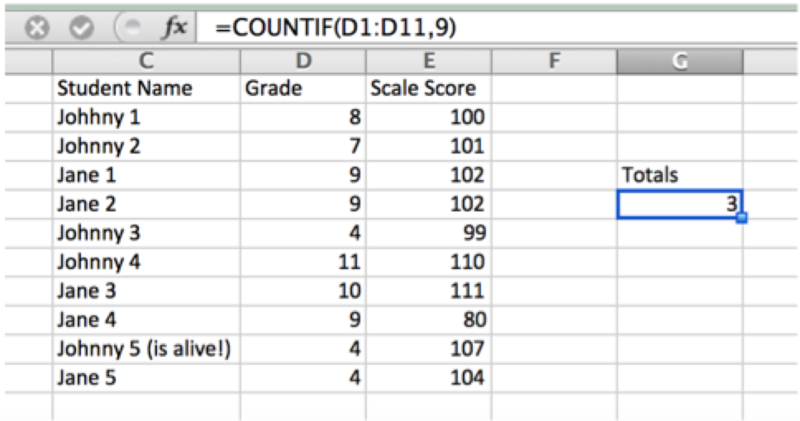 I also have some nice metrics to consider like the Total number of students in a certain grade, the total sum of scale scores, and the average scale score. D: 0… for FALSE, meaning that I want an exact match. Alright, let’s get back to our example. Let’s say we want the performance level but this data has the student ID and NOT the Student name so we are having to match by Student ID. No Problem! We’ve seen this before! But wait… for some strange reason the student ID isn’t at the beginning. Oh no! We can’t use VLOOKUP! But never fear for we have harnessed the power of Index Match! First of all, let’s take a look at what the other data looks like now. Notice the Student ID isn’t at the front of the column so we can’t use VLOOKUP. Instead we can use our Index Match function. On the figure below, the first parameter is the column C on my “other” data sheet (listed above). This column has the data point that I’m interested in displaying. Next, I use my match magic and tell excel to look in D2 (the student ID) on my primary sheet and then to look at column D on my “other sheet” to find the appropriate row remembering to use 0 to match exactly. This tells excel, “hey, I want you to find the row where the student ID exists on both sheets”. Finally, Index is saying, “got it! I’ll display the data in my performance level column that is on the same row as the student ID that we matched.” And voila! We have successfully used Index Match. All that remains is to copy it down the row (and to remember to use our IFERROR function to clean up the mess) and we are done! P.S. : Because on the back end all INDEX is doing is displaying the value of the cell that occurs at the intersection of a Column and Row, if you switch the MATCH function to be the first argument that Index takes, you can do the same thing for rows (which is the replacement for HLOOKUP)! Here, I’ve referenced Column C, which is my student name column. Therefore, my combo box will display all of my entries in column C. I’m linking the combo box to cell K4 and we notice on the sheet that currently cell K4 says 10. Why, because my student, Johnny 5, has his name on the 10th row of Column C. Got it? OK, now we can add our Index Functions or Sum Functions or whatever to display the information easily. In the following example, I’ve selected Jane 5 from my combo box, and I used a quick little Index function to say I want to display what’s on column D at whatever row is listed in K4. In this case, because I’ve tied my combo box to K4, the cell is displaying 11. So Index is looking for whatever exists in Column D at Row 11, which happens to be Jane 5’s Student ID. With a simple example like this it really is redundant, but if you had 10,000 students and wanted to see a summary of just one of them? Combo Boxes and List Boxes work amazingly well. COUNTIF(range,criteria) – the range is the column you want to count, the criteria is what you’re interested in counting. SUMIF(range,criteria,sum_range) – the range is the column where you want to look for your criteria, the sum_range is the value you want to add if the criteria is matched in the range. VLOOKUP(lookup_value,table_array,col_index_num,range_lookup) – the lookup_value is the data in the primary sheet that you’re matching to your table_array (my “other” sheet), the col_index is the column number of the data on the “other” sheet that you want to display, and the range_lookup for our purposes is always 0 which means you want to match the lookup_value exactly. INDEX(array,MATCH(lookup_value,lookup_array,match_type)) – the array is the column of data from the “other sheet” that you want to display on the primary sheet while the lookup_value is the datum in the primary sheet you are matching against the lookup_array on the “other sheet”. The match_type for our purposes is 0, which means that you want to match the lookup_value exactly. You never really know what Richard Walter might be up to. Sometimes it's searching for the best BBQ in Texas, sometimes it's spending hours nerding out in Excel looking for data statistics mistakes. What you can be sure of, is that he is going to go the extra mile. 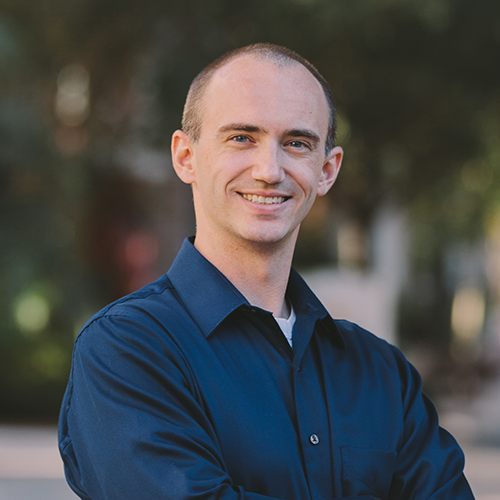 At SchoolStatus, Richard is always on the road, working to bring the best tools for data and communication to educators everywhere. Find out more about combining your student data with real community and stakeholder engagement here.